Nature is a source of inspiration for humanity and has always been a mirror to humankind – where the finest works of art and architecture are inspired. The ability of nature to combine beauty, economy and functionality is incomparable and it is not a coincidence that the great inventions through history have their origins in analogous natural elements. 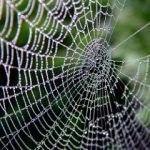 The concept of Biomimicry, widely approached by contemporary science, consists of analyzing natural systems and reproducing its principles in solutions, and become outstanding contributions to society. The solutions offered by nature can contribute to the creative process, both in the form of an analogy, and through its geometric/mathematical patterns. It is possible to observe, for example, constant mathematical proportions in human, animal and plant constitutions. These natural geometries are often associated with concepts of aesthetics, harmony and balance, constituting true aspects of beauty. In areas such as industrial design, architecture, engineering and others, it is possible to observe the constant use of analogies and direct application of principles of nature in the search for conceptual and innovative solutions. Biomimicry is a technologically oriented approach to apply the lessons of natural design that seek to solve the problems of human beings. Biomimetic studies are grounded in natural design solutions, decoding geometries and performance, in search of better utilization and lower energy expenditure. Nature as a mentor: New way to observe and evaluate nature. Do not worry about what we can extract from the natural world, but what we can learn from it. According to Benyus , for a society that is used to dominating or ‘improving’ nature, imitating her in a respectful way is a radically new approach, a true revolution. Unlike the Industrial Revolution, the Biomimicry Revolution introduces an era based not on what we can extract from nature, but on what it is possible to learn from it. By doing things the way nature does them, it is possible to change the way we cultivate food, produce materials, create energy, heal illnesses, store information and conduct business. After 3.8 billion years of research and development, failures are fossilized, and what surrounds us is the secret to survival. By looking deeply into nature, we realize that all human inventions are already present in it, albeit in more elegant formats, with a much lower cost to the planet. Even one of the most intelligent systems of construction – using columns and beams – is already featured in the internal structure of lilies and in bamboo stalks. Central heating and air conditioning are accomplished by termite towers. The best manmade sonar is difficult to hear in comparison to the transmissions of the multi-frequency bat. Even the wheel, which has always seemed to be a uniquely human creation, was found in the small rotary motor that drives the flagella of the oldest bacteria in the world . Nature works in the sunlight. Nature stops waste from the beginning. Nature touches the power of limits. According to the biologist John Todd (2000) , the Earth’s ecology has a set of instructions that we urgently need to decode and employ in the conceptualization of human systems. After forty years of research in biology, ecology and design, Todd emphasizes that it is possible to design with nature. Through eco-design a more advanced civilization can exist, using only a tenth of the planet’s resources that industrial society uses today. The living world is a matrix for all design. Design should follow, not oppose the laws of life. Biological equity should determine design. Design should reflect the bioregion. Design should be based on renewable energy sources. Design must be sustainable in the integration of living systems. 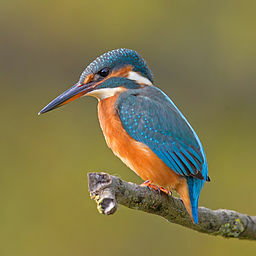 Design should be co-evolutionary with the natural world. Construction and design should help heal the planet. According to Isenmann , economists and engineers often use biological analogies, specifically from organisms (analogy with evolution, with fractal growth, with the brain, etc.) in order to solve socio-economic phenomena. However, without an associated conceptual framework and in the absence of philosophical enlightenment, the prospect of industrial ecology as a means to understand nature as a model probably remains speculative. It is worth questioning whether the work related to biological analogies results in something new, or if it is just a reordering based in common sense. Strengthening the basis of industrial ecology is useful for protecting the powerful idea that nature serves as a model, rather than just using it as a simple rhetoric or a note in the literature of environmental management, as a beautiful accessory. The root cause of the total unsustainability of modern civilization lies in the dualistic separation of nature and culture. It is in nature that all people and all species are united in a community of life. However, culture is usually conceived of as something independent and separate from nature. Despite this reversal of cultural values, since the industrial revolution, reductionist science has allowed man to design a series of powerful and manipulative technologies, which are transforming the planet in a devastating way . 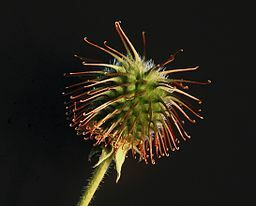 The great biomimetic innovations of mankind alert and question: What will the Biomimicry Revolution do differently than the Industrial Revolution? Who can assure that the thunder of nature will not be stolen and used in a campaign against life? This is not an infantile concern; one of the most important biomimetic inventions was the airplane, inspired by the flight of birds. Men flew for the first time in 1903, but in 1914, were already dropping bombs from the sky. Maybe what is really necessary is not a technological change, but an internal change of mentality that allows for sensitivity to nature’s lessons . Some examples of design, art, engineering and architecture are direct applications of solutions based on principles of nature. These principles can be expressed in mathematical patterns, geometric shapes or functional propositions that resemble, or seek inspiration in, natural references. Leonardo da Vinci, an exponent of the field of engineering, said that despite its great genius, mankind will never find a more beautiful, economical and objective invention than nature. The observations and experiments described in his journals, among which it is possible to find the first idea of submarines, hang gliding, war tanks, bridges and dozens of mechanical pieces, are clear examples of the inspiration he derived from natural models . 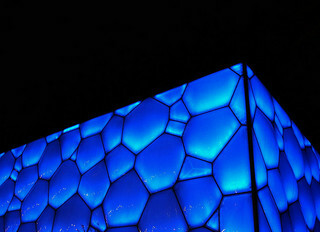 In the field of architecture, there are two examples, both built in China, for the Olympic Games of 2008: the Water Cube and the Bird’s Nest – inspired by elements of nature, and named after them. The basic structure of the first building is based on bubbles and, although none look the same, they all follow the same general pattern (Fig 9). The second building is based on the plots and tresses of a nest, replacing the traditional straw with steel (Fig 4). the invention of the airplane based on the analogy of birds, and also respects the golden ratio. 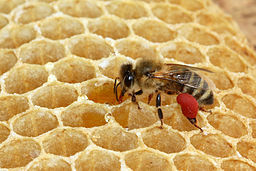 Another smart creation that simultaneously solves the problem of high resistance and lightness of mechanical parts is the honeycomb, developed from the geometry of the honeycomb of beehives (Fig 7). 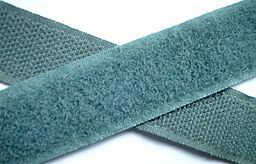 Also within the industry, it is interesting to highlight the creation of Velcro (Fig 6), based on the structure of bur (Fig 5). 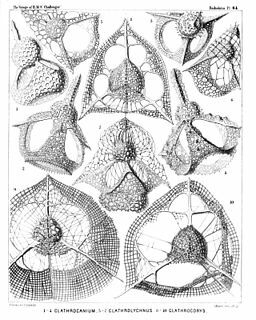 Robert Le Ricolais (1894-1977), a French architect and engineer, used the reticulated pattern of Radiolaria (Fig 10) – marine protozoa – as inspiration. Through his research, he developed structural principles that resulted in strong, light weight and durable structures. The goal was to build “infinite strength and zero weight” structures. 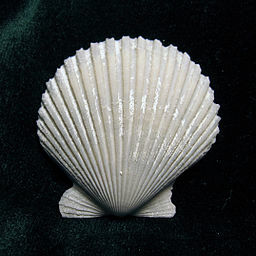 The same researcher studied the corrugated shells – Pecten (Fig 3) – producing rigid plans and corrugated surface tubes . 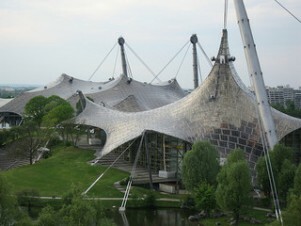 Frei Otto, from the Lightweight Structures Institute, University of Stuttgart, organized a program with biologists, architects and engineers (also mathematicians, ecologists, philosophers and sociologists) with the objective of extracting useful ideas from biology. These can be found in the tensioned structures that he used to cover the Olympic Stadium in Munich (Fig 8), among other structures. These membranes were inspired by the horizontal webs built under water by the aquatic spider, Argyroneta, known to retain air for the sub aquatic development of their eggs. This concept was also used by Jacques Rougerie in the design of an underwater village to accommodate 250 divers . 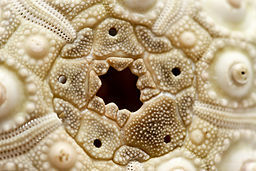 Another interesting natural structure to be studied is that of the sea urchin. The foam-like structure that connects the thorns to the main body of the sea urchin (Fig 11) gives support to the thin outer wall, resists buckling up, and allows it to bend without breaking. In their research, Lorna Gibson and GN Karam distinguished different internal structures of the tubes, which were analyzed as cylindrical cartridges. The theory of cellular material shows that the rigidity of the cell structure is a result of the densities achieved, which can vary according to the geometry of the cell structure. The recent development of the process that allows the production of metal cylindrical tanks, having a foam or honeycomb core, demonstrates the importance and applicability of the research carried out. The knowledge that was concealed in nature can now be extended to lightweight tubular supports, such as the ones found in the suspensions of race cars. The examples discussed above demonstrate the existence of intelligence in nature, responsible for the constitution of every little particle. In nature, nothing seems random and everything has its place and shape needed to better serve the whole. The wisdom of nature has still much to unveil to man, but this will only be possible, as the philosophical traditions say, when humans actually feel committed to their surroundings and responsible for the proper application of the teachings. BENYUS, J. Biomimicry: Innovation inspired by nature. New York. Quill Publisher, 1997. SOARES, M. A. R. Biomimetismo e Ecodesign: Desenvolvimento de uma ferramenta criativa de apoio ao design de produtos sustentáveis. Lisboa. Universidade Nova de Lisboa – Faculdade de Ciências e Tecnologia, 2008. ISENMANN, R. Industrial Ecology: Shedding more Light on its Perspective of Understanding Nature as Model. Sustainable Development, 2003. VINCENT, J. F. V. Applications – Influence of Biology on Engineering. Journal of Bionic Engineering 3, 2006. 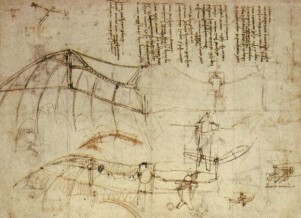 VINCI, L. D. Da Vinci por ele mesmo/tradutor Marcos Malvezi. São Paulo: Madras, 2004. WAHL, D. C. Bionics vs. biomimicry: from control of nature to sustainable participation in nature. WIT Transactions on Ecology and the Environment, 87, 2006. Frist published by FIDIAS Institution for Architecture & Plastic Arts, 2014. Translated from Spanish.